Note: This is a classical tomb that far surpasses all others in the Valley of the Kings both in size and in the artistic execution of the sculptured malls. Every inch of wall space of its entire 100-metre length is covered with representations which were carried out by the finest craftsmen. Giovanni Belzoni, who discovered the tomb in 1817, was a circus strong man who originally came to Egypt to market an irrigation pump he had designed in England. The project fell through but he arranged the successful transportation of the colossal head of Ramses II from the Ramasseum to the British Museum in London, and by the standards of the day he was forthwith an archeologist! He turned his energies to the Valley of the Kings and made this remarkable find just one year later. When the Turkish officials in Egypt heard of the discovery they straightway made for the tomb, bent on the delightful thought of acquiring priceless treasure. Down the corridors they went, ransacking every corner only to find to their disappointment that the tomb contained no more than an empty sarcophagus. A steep flight of stairs leads to the entrance of Seti’s tomb which is covered with sacred texts along its full length from the highest reaches down to the bed rock. The first corridor (/) is carved in high relief. On the left-hand wall (a) the sun-disc bearing a scarab, and the ram-headed Sun-god can be seen between a serpent, a crocodile and two cows’ heads. The texts which start on the left are continued to the right (b). The roof is painted with flying vultures. The second corridor (2), which is staircased, has thirty-seven forms of the Sun-god depicted on the upper part of the recesses on both sides. As we descend to the third corridor, Maat, goddess of truth, faces us with outstretched wings above the doorway (f). Isis is represented on the left-hand side (d), and Nephthys on the right W, and they both kneel on the hieroglyph for ‘gold’ and place their hands upon a seal ring. Above them, on each side of the corridor, t e jackal-god Anubis can be seen. The wall reliefs here have not been, competed but we can see the outlines in black, the master’s ouch in red, and the accuracy with which the relief is carved from the bottom upwards. Proceeding beneath Maat with her outstretched wings we pass fifth V 6 corridor (j), which has dramatic representations of the fifth hour of night from the fifth chapter of the Book of the Dead. Towards the middle of the left-hand wall (/) the sun-boat (damaged) ii4 is driven through the netherworld by seven gods and seven goddesses and in front of it march four gods and the goddess Isis. On the right-hand wall (g) the Sun-god and his retinue are drawn through a land inhabited by demons and monsters (top and bottom rows) and we see a serpent with three heads, wings and human legs. But the Sun-god is safe, drawn by Horus and Thoth (middle row) who carry an eye as a protection against evil. The ceiling is blackened from the candles of the early Christians who hid in the tomb. From the third corridor onwards the quality of the colour on the reliefs is superb. We now come to a small ante-chamber (4). The walls, both to left and right, show the Pharaoh between Harmachis and Isis offering wine to Hathor. We now enter a square chamber with four pillars (5). On the pillars themselves the Pharaoh is shown before the various deities: Isis and Nephthys the sister-wife and the sister of Osiris, Hathor the goddess of joy and love who was also the goddess of Dendera to whom the cow was sacred, Selket the goddess to whom the scorpion was sacred, Horus the national Sun-god, and Harsiesis and Harmaches who were special forms of Horus; also of course Anubis, the jackal-god of embalming. The walls, especially those at the sides, have marvellous representations of the sun travelling through the fourth region of the underworld. On the rear wall (h) Osiris is enthroned before Hathor while the Pharaoh is led into his presence by the hawk-headed Horus. This is a superb mural with intricate detail and rich colour. Near the corner of the left-hand wall (*) the four chief races of men known at the time stand before Horus: these are Egyptians, Asiatics with pointed beards and coloured aprons, four negroes and four Libyans with feathers on their heads and tattooed bodies. The chamber (6), situated to the right and entered via a narrow flight of steps, was never completed. Whether this was because it was discovered that the w alls were of inferior material, or as a blind to mislead grave-robbers, is not known, but the sketches on the walls are bold and compelling and show the touch of a master craftsman. The original sketch was done in red. The corrections in black were probably the work of the senior artist, after which the carvers took over. The left-hand wall (j) shows the journey during the ninth hour of the underworld: the sacred cow, ram, bird and human head guarding the procession against the fiery serpents. On the rear-w (k) is the tenth hour with the hawk joining the protective deities and the spirits carrying arrows and lances. On the right-hand wall (/)is the eleventh hour with the condemned in the lower row. The enemies of the Sun-god are being burned under the supervision of the hawk-headed Horus in strange furnaces, whilst fire-breathing goddesses stand watch with swords. We retrace our steps to the chamber of pillars (5), to the left of which a stairway, carefully concealed by the builders of the tomb descends to the fourth corridor (7). To the left of this corridor (m) is a figure of the Pharaoh (destroyed) seated at an offering table. Above him hovers a hawk and before him stands a priest. We descend a few more steps into a small corridor (5) which is decorated with texts of the ceremonies performed before the statue of the deceased Pharaoh in order that he may eat and drink in the hereafter. On the right-hand wall (n) is a list of offerings. The ante-chamber (9) is decorated with the gods of the dead including Anubis, Isis, Hathor, Harsiesis and Osiris. Finally we come to a large hall (/o). Here a slight incline with steps at the sides takes us to the burial chamber, which comprises two portions. The front portion has pillars and the rear portion a vaulted ceiling. It was in the rear section that the alabaster sarcophagus of the Pharaoh stood when the tomb was discovered. It was made out of a single piece of alabaster, carved to a thickness of two inches and with the exquisite reliefs filled in with blue paste. This magnificent piece is comparable only to the alabaster vase found in Tutankhamun's tomb which is today in the Cairo Museum. The mummy, which was one of those found at Deir el Bahri, is in the same museum. The sarcophagus lies in the Soane Museum in London. When Belzoni effected its transportation to England, the Trustees of the British Museum considered the price set too high and the treasure was without a buyer until 1824 when Sir John Soane paid Henry Salt £2,000 for it. The decorations on the walls of the pillared portion of the hall show the journey through the first region of the underworld on the left entrance-wall (0) and through the fourth region of the underworld on the left-hand wall (p). In a small recess at the end of this wall (q) is a beautiful representation of Anubis performing the opening-of-the-mouth ceremony before Osiris. On the right-hand entrance wall (r) and the right-hand wall (s) are representations o the journey through the second region of the underworld. The vaulted ceiling has been painted with astrological figures. From early times, of course, the Egyptians had mapped out heavens, identified some of the fixed stars and were able to determine the positions of others. This ceiling is unusual in that it has no been painted in the familiar balanced, repetitive form. Adjoining the tomb chamber are four side-rooms. The first one on the right (//) has the text of a myth that concerns the rebellion of mankind against the Sun-god, their punishment and final rescue. On the rear wall is a magnificent relief of the heavenly cow of the myth supported by Shu, the god of the atmosphere, and bearing on its back two boats of the sun. The chamber on the left (12) has a shelf decorated with a cornice running round the three main walls. It contains more dramatic representations of the Pharaoh’s progress through various provinces, safeguarded by the spells of Isis, the sacred ibis and the ostrich feather symbol of justice and truth. Spirits and demons (left-hand wall (t), middle row) greet the procession. The foes of Osiris are beheaded by a lion-headed god (top row), and dwellings of the deceased gods and spirits open their doors as the Sun-god approaches (rear wall (u), middle row), showing the dead restored to life, and serpents with heads of genii of the dead upon their backs, or with swords in their hands, rising in unison to annihilate the foes of the Sun-god at the end of the journey. The Pharaoh will overcome. With the help of the Sun-god the doors of the hereafter are open to him. He will enter with his valuables and possessions; with the ability to eat and drink; and imbued with life so as to reign again. This is his ultimate hope. Thirty-five years ago Sheikh Abdel Rasool, a descendant of the Rasool family of Deir el Bahri fame, told the Antiquities Department that he considered it his duty to share with them an intelligence that had come down by word of mouth for generations: that beyond the burial chamber in the tomb of Seti I was another chamber. Although such an extension beyond the burial chamber would be completely irregular, excavations were nevertheless enthusiastically commenced in the hope that if there were such a chamber it would contain some of the funerary furniture of the deceased. The passage was cleared and continued on a steep decline. The walls bore no decoration. Nearly ninety metres were dug before work was to be abandoned when it was noticed that fissures had appeared in the burial chamber, doubtless caused by the vibration, temperature an humidity changes from the workers. Although excavations were halted, visitors were not. 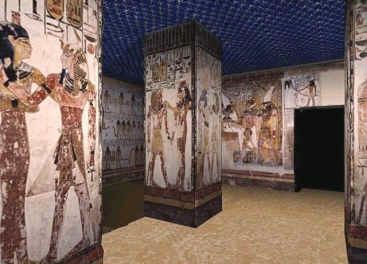 All were intent on seeing the largest, most beautifully decorated and well preserved tomb in the Valley of the Kings. Sometimes groups of tourists would overlap, adding to the humidity. There would be jostling in the corridors, with people pressing against the unprotected reliefs For some reason countless tourists trail their fingers, often damp from the heat, along the outlines of carvings. Little wonder that such abuse should take its toll. Seti’s tomb became a victim of tourism and is periodically closed to control damage. (See Chapter 10 ‘Action in Luxor’).